Massachusetts Teacher of the Year Audrey H. Jackson. Fifth-grade students at Jamaica Plain’s Joseph P. Manning Elementary School say Audrey Jackson is the kind of teacher who takes time to care for the needs of each child. “If anybody ever falls and needs help, she makes sure they get back up and does whatever she can to get them back on track,” said 10-year-old Daphne Partridge of Jamaica Plain. Last month, on a five-day field trip to a Vermont farm, Jackson’s efforts to comfort homesick children, dealing with the night fears of those unaccustomed to sleeping away from parents, earned her a “Mother Hen” award. 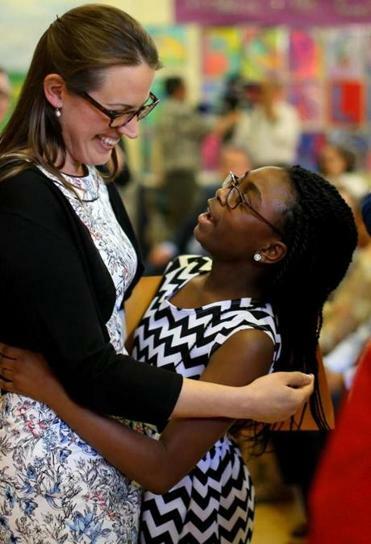 On Tuesday, Jackson received an honor she will treasure at least as much: Massachusetts Teacher of the Year. Jackson, 33, is the 54th person to receive the state’s top honor for educators since the program began in 1960, and only the seventh from Boston Public Schools. The honor makes her the Commonwealth’s candidate for the national Teacher of the Year award. Even as she was praised for effectively teaching children who have experienced emotional trauma alongside those who have not, Jackson insisted that she is just part of a team of educators dedicated to a shared goal of full classroom inclusion. He praised Jackson and the Manning School for pursuing a full-inclusion policy. A native of East Montpelier, Vt., Jackson earned a bachelor’s degree at Williams College and master’s degrees from the Boston Teacher Residency Program and the Harvard Graduate School of Education. The Teacher of the Year selection process began last fall with nominations from parents, educators, and others, creating a field that was reduced to nine semifinalists and then to five finalists. The other finalists were Bridget Adam, a math teacher at Boston Collegiate Charter School; Brett Pangburn, an English teacher at Excel Academy Charter School in Boston; David Kujawski, a middle school science teacher in Walpole; and Jennifer Ormerod, a second-grade teacher in Rehoboth. Because the honor comes without a trophy or a plaque, children made their own certificate that students Daphne Partridge and Nevaeh Johnson presented to Jackson at Tuesday’s ceremony. “We do a lot of work on empathy . . . and that they had the intuition and thoughtfulness to create that was really awesome,” Jackson said. Daphne said it makes her sad to contemplate moving on to sixth grade at another school next year. “She’s probably the most spectacular, phenomenal teacher that I’ve had in my entire life,” Daphne said.